Here is something new coming from Cesar Sommer, in the form of new stereoscopic 3D photo portfolio containing some celebrities that he’s shot in stereo 3D. Cesar is a photographer and a producer of stereoscopic 3D content as well as an established commercial photographer in 2D. He most known as being one of the first “Digital 3D” fashion photographer worldwide using the emerging 3D technology. His first 3D Portfolio Reel also was used as demo content for the premiere of YouTube in 3D at CES 2009 in Las Vegas and his 3D works were also featured here on the blog multiple times. He is also the first or one of the first to photograph celebrities in digital 3D such as the Grammy nominated Rapper Redman and 2x Grammy winning Fatman Scoop or Bobby V who won a Urban Music Award for Best R&B Act. 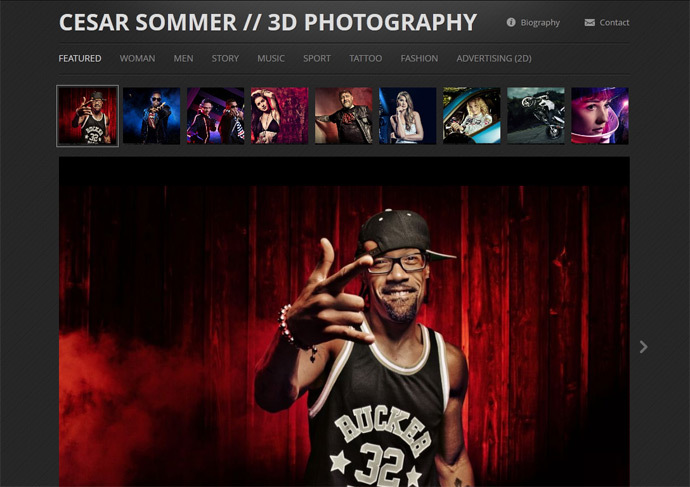 Cesar Sommer’s 3D photographer portfolio homepage is a world premiere and has been realized by Phereo, a company at the forefront of 3D technology. Phereo specializes in stereo image processing and developing new 3D technologies for the web, mobile devices and home entertainment systems. As one can see it offers new ways to display 3D images on web sites making it easy for viewers with different stereoscopic 3D display devices to be able to enjoy them in 3D. Cesar’s 3D photo portfolio takes advantage of a new feature for the Pro users of the Phereo service that allows the users to easily create a dedicated page with selected stereoscopic images to showcase their best 3D photography works.